Beverages with a lid are allowed in the theatre. No food is allowed in the performance space. Concessions are available on site. If you have questions, please email them to spinghousetheatre@gmail.com. Please look for the WILL CALL sign in the lobby to pick up your tickets. If you do Print-at-Home tickets, please check in at the desk, so we know you are in attendance. Parking is available onsite at no charge. Over the River and Through the Woods was staged in the Springhouse BlackBox Theatre to sold-out shows and thrilled audience members in 2014. We are so excited to bring this delightful show to the main stage. While Over the River and Through the Woods will touch your heart and your funny bone, this show is not recommended for young children. 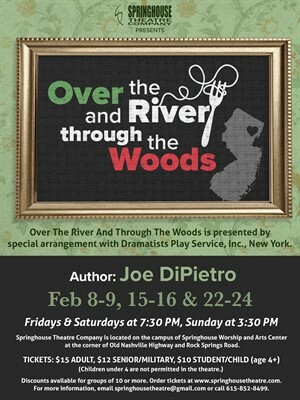 Over the River and Through the Woods by Joe DiPietro is presented through special arrangements with Dramatists Play Service, Inc.